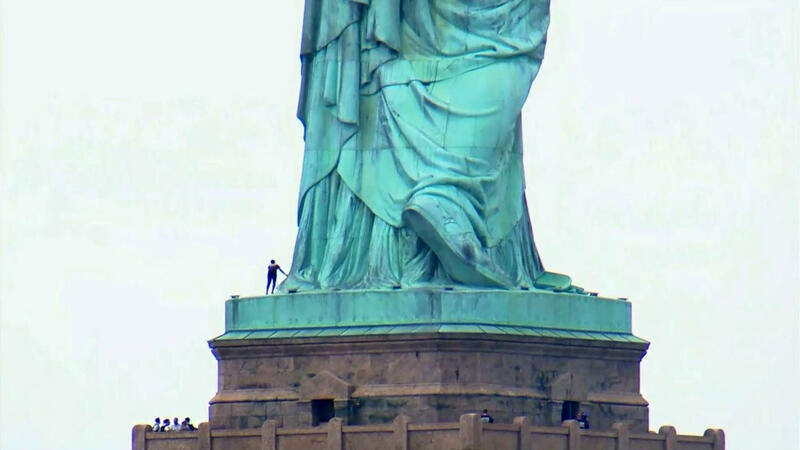 NEW YORK — Liberty Island in New York Harbor was evacuated Wednesday after a woman climbed onto the pedestal of the Statue of Liberty. After about three hours, two police officers eventually reached the woman and helped her down. U.S. Park Police identified the woman as Therese Okoumou, and said she faces multiple charges including trespassing, interference with National park regulations, and disorderly conduct. When officers reached her, they engaged with her to convince her to come down. Det. Brian Glacken of the NYPD Emergency Services Unit said she was " little combative" at first, but they established a "good repertoire" with her and eventually she even "apologized" to him and his partner that they had to take her down. Glacken said at press conference that she talked to them about the "children in Texas," referring to the Trump administration's zero tolerance policy that separated families who entered the country illegally. Officers put a harness and rope around her to get her down. About 16 officers participated in the rescue, police said. Park officials first responded around 4:10 p.m., reports CBS New York. Sgt. David Somma of the U.S. Park Police told CBS News that officials didn't consider her a direct threat, but said her climbing the statue was a "threat to public safety." The woman, who was alone, had given "no indication" of why she was climbing the statue, Somma said. National Park Service spokesperson Jerry Willis said people on Liberty Island were taken to neighboring Ellis Island, Battery Park in New York City or Liberty State Park in New Jersey. At first, the woman kept changing locations, so officers were not able to communicate with her, Somma said. Earlier in the day, at least six people who hung a banner emblazoned with a message about abolishing the federal Immigration and Customs Enforcement agency from the statue's pedestal were arrested. The sign read, "Abolish I.C.E." ICE is a division of the Department of Homeland Security whose officers arrest and deport unauthorized immigrants inside the U.S., among other duties. A member of the protest group, Rise and Resist, told CBS News that the woman who climbed onto the statue's pedestal was a fellow member, CBS News correspondent Anna Werner reports. The protester who spoke to CBS News didn't identify the woman but said that the group wasn't aware of her plans. Earlier, Rise and Resist said on Twitter that the woman was not linked to them. Activists with the group say they hung the banner to protest U.S. immigration policy. They oppose President Trump's administration and advocate ending deportations and family separations at the U.S.-Mexico border. Attorney General Jeff Sessions has said the president's immigration policy is a step forward for public safety. Willis says federal code of regulations prohibits hanging banners from the monument.